Through serendipitous discovery, I’m also submitting this entry into the "Heart of the Matter" round-up for May. This is a new, but great monthly event where a round-up of heart-healthy recipes is gathered. Read more about it on the new blog - http://heartyeating.blogspot.com This month's is being hosted by Ilva, of Lucullian Delights, a super fab blog you should all check out. Though I know my habits vascillate between the angelic and the demonic, it really is a great endeavour to try to eat healthy foods. Healthy can be yummy. It can be SOOOOO yummy. You know what madness is? It's 50 cent mangoes. That's pure madness in this part of the world. Of course, I had to stock up. 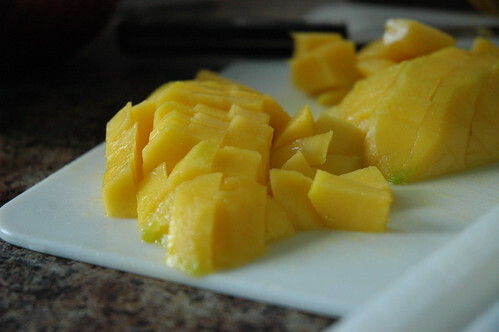 And now I have a drawerful of juicy, juicy mangoes to devour and enjoy. 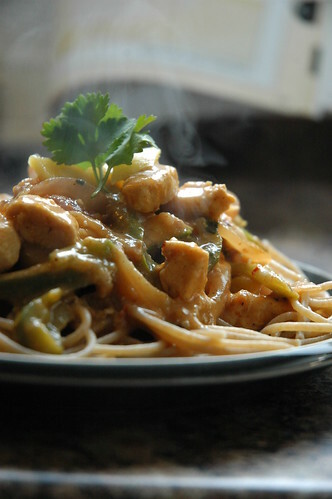 This recipe is shamelessly ripped off of Cooking for the Rushed, The Healthy Family. I changed it a little bit, but it's not really my recipe. It's yummy though. Quick to put together, and very tasty. 1. Fill a large pot with water. Cover and bring to a boil. 2. Spray a large nonstick fry pan with cooking spray and heat to medium-high. 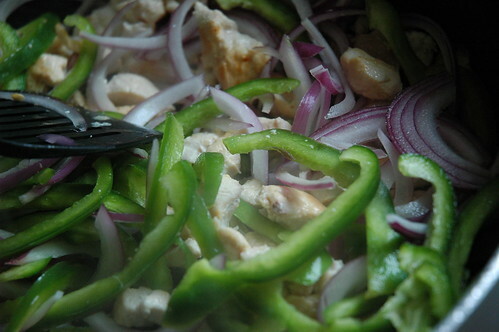 Cut chicken into small pieces and gradually add to pan as you cut. Stir until meat is no longer pink. 3. Slice onion and pepper into thin strips and add into pan as you slice. 4. Add garlic, curry paste and flour to the pan. Stir to coat chicken. 5. Gradually add chicken broth, mango purée and milk, stirring as you add. Add peach jam and crushed chilies. 6. Add pasta to boiling water and set timer for 8 minutes. 7. If you haven't already done so, dice your mango. Add it to the pan, along with the fresh coriander. 8. Rinse cooked pasta in a colander with hot water. Serve topped with fresh mango and coriander. YUM. Wow that looks so Yummmy! !Next time I might have to get you to send some my way. Healthy AND tasty... what a great combination. Thanks for sharing! WOW! an incredible combo of flavors. It sounds and looks really incredible! meat and fruit are very good together... mmm chicken and pineapple!! Always a hit!! stacey25 - it is yummy. you can whip it up in less than 30 minutes - you should try! christie - the whole "meat and fruit" thing is slowly growing on me. I still vehemently despise the idea of pineapple on pizza, but pineapple in sweet and sour chicken is good. Mango and pesto on pizza with chicken is also good. This is good. You should try it and see! culinarily curious - thanks. As mentioned in the post, can't take credit for the recipe, but it is quite yummy. Just think how much more decadent it would be if one were to sub coconut milk for the regular milk, eh? This is great! Thanks a lot for your entry! This looks so tasty. I'm printing this one for sure. I love the combo of mango and chicken. I like a lot of fruit/meat combos. I come from East Africa, so cooking fruit with meat is a no brainer. I'm always looking for new things to do with mangos. Try making a salsa of mango, roasted red pepper, jalepino, cilantro, garlic and lime juice then using it as a topping for bbq'd steak. Yummm!! Kate in T.O. I've been meaning to make this recipe forever -- and I finally did! Though this post is almost a year old now, I wanted to come back and say thank you. It was absolutely delicious, and very easy. 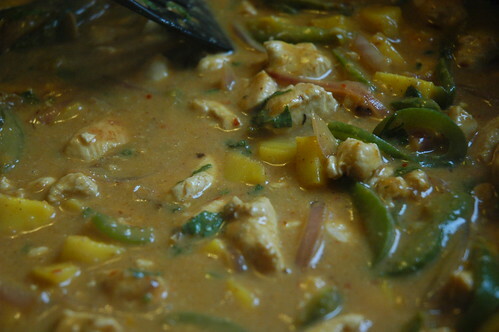 I made a few modifications: used skinless chicken thighs instead of boneless/skinless chicken breasts; used coconut milk instead of milk; used a thai-inspired curry mix (with ginger), since it was on hand; served over rice noodle vermicelli. I loved the idea of adding pureed mango to the mix - a nice thickener. Definitely a keeper on our regular rotation.